Today, I’ll demo how to train a logistic regression model in BigQuery ML. That is Machine Learning models written in SQL, and executed in BigQuery. All of what I am writing here is my personal opinion, and not written in any affiliation with Google. Have you ever wondered whether you can do Machine Learning with SQL only? 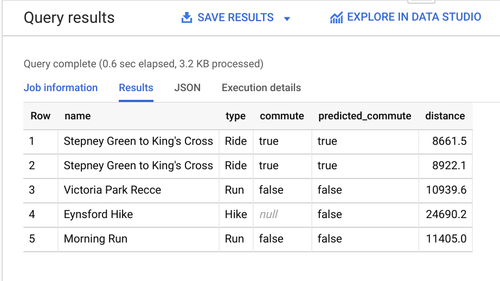 I had not, but when I heard of BigQuery ML, I got curious,and gave it a shot. You can think of BigQuery as managed storage and a query engine. You can think of BigQuery ML as managed storage + query engine + basic machine learning. Let us predict whether a given activity recorded on Strava was a commute or not. I will skip over the usual steps of exploring the data, and cleaning the data because I know the data very well. So let’s go ahead and split the data deterministically into a training set (around 80%) and test set (around 20%) by hashing the identifier, which remains stable when running the queries again. Note here that we discard entries from the training set where no value was recorded for the commute label. That’s done. Now, I have one tables of activities for use as a training set (381 rows), and one table of activities for use as a test set (86 rows). I will hold the test set aside until the very end when I have finished training the models. Once you remember the syntax, training a logistic regression model for classification is pretty straight-forward. Let’s start with a simple model which tries to predict whether an activity was a commute based on the distance. I know that the distance is probably a good predictor because commutes tend to have the same distance as opposed e.g. to runs on the weekend. Let’s also take elapsed time into account. It’s quite easy to create a bunch of models, by copy-pasting the SQL query and then adding another feature. Let’s also add a model which takes the type of the activity into consideration. After all, I rarely use ice skates to commute to the office (although I wish I could!). Note how even categorical data works as features without additional prep. Finally, I rarely commute to work on weekends, so let’s add that feature as well. Now I have the models trained, let’s take the simplest one (which only considers distance), and predict a few labels. Putting the results into a table, here are the results of the four models evaluated on the test set. If you look at the ROC AUC, it gets progressively better the more features I added. Of course, as I said, I know the dataset very well, so the choice of features was no accident. And that’s Machine Learning using BigQuery ML.